Nepal, a landlocked country in South Asia in the Himalayas bordered by People’s Republic of China, and the Republic of India has a total land area of 56,827 square miles and a population of over 29.3 million. Nepal looms high with eight of the world’s ten tallest mountains, including Mt. Everest. Deforestation has taken its toll on the once spectacular terrain. Agriculture, services and industry are the staples of its economy. Recent political events have taken the steam out of the tourism industry which its diverse landscape called for. Gurkha soldiers serving in the Indian and British armies also bring in revenue. October through May are considered tourist friendly with October/November and February/March having the best trekking conditions. Undoubtedly mountaineering is Nepal's best offering. It is also a nature lover’s paradise with its various biomes. Chitwan National Park is a World Heritage Site Kapilavastu, the birthplace of Budha, is another World Heritage Site. Nepal’s cuisine is mostly vegetarian and a variety of spices are used. A typical meal is lentils soup, and rice with curry on the side. 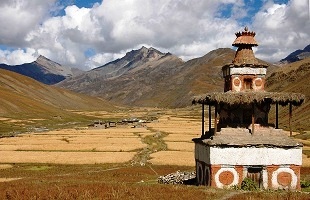 Lonely Planet Nepal Country Guide 978-1741048322 $18 62 maps including Everest Base Camp and Annapurna Hikes. Trekking section covers 40 pages of the 420-page book. Nepal Nelles Map 978-3865742513 $12 1:1,500,000 Scale with eastern Nepal at 1:480,000 Scale. National parks and places of interest highlighted. Town maps of Bhaktapur, Thamel, and Pokhara Lakeside. Everest Base Camp Nepal Adventure Map 978-1566955195 $10 Includes Trail Routs, Villages, Cultivated Areas, Park Boundaries, and points of interest. Waterproof and tear-resistant. The first stamps of Nepal were a set of six stamps released in 1881 showing a simple Sripech and Crossed Khukris design. The set (Scott #1 to #6) catalogs for around $1450 mint and around $2000 for used. This was followed in 1886 by a set of three stamps in the same design in different denominations and colors. The set (Scott #7 to #9) is relatively inexpensive cataloging for around $80 mint and around $30 for used. Varieties on the same design and another design showing Siva’s Bow and Two Khurkis were the main stamp issues of Nepal during the period till 1907. Nepal released a set of four stamps in 1907 in the Siva Mahadeva theme. The set (Scott #26 to #29) catalogs for around $45 mint and around $3 used. The same design was redrawn and released in new sets in 1929 (Scott #30 to #37), in 1935 (Scott #38 to #43) and then again between 1941 and 1946 (Scott #44 to #50). Each of those sets is more valuable and catalog in the $100 range for mint and around the $30 range for used. A set of nine stamps released on October 1, 1949 showing local scenes. The set (Scott #51 to #59) catalogs for around $60 mint and around $20 used. The designs show Swayambhunath Stupa, Temple of Krishna, View of Kathmandu, Pashupati, Temple of Pashupati, Tri-Chundra College, Mahabuddha Temple, Guheswori Temple in Patan, and the 22 fountains at Balaju. Nepal has a rich mountainous geography and has eight of the world’s ten tallest mountains including Mount Everest, the highest point on Earth. A set of twelve stamps released on April 15, 1954 showing the Map of Nepal in different colors. The set (Scott #72 to #83) catalogs for around $95 MNH and around $15 used. A set of four stamps released on September 17, 1977 showing the Birds of Nepal. The set (Scott #331 to #334) catalogs for around $5 MNH and around a dollar for used. The designs show great pied hornbill, cheer pheasant, green magpie, and Nepalese laughing thrush. A set of four stamps released on May 8, 1998 in the Visit Nepal theme. The set (Scott #625 to #628) catalogs for around $4 MNH and around $2 for used. The designs show sunrise, Shree Antudanda, Maitidevi Temple of Kathmandu, Great Reunification Gate at Kapilavastu, and Mount Cholatse at Solukhumbu. Several other sets in the tourism and visit Nepal themes were released over the years and all of them catalog for a slight premium over the regular issues from the same period. The country has a huge potential for tourism as it features spectacular and diverse landscape along with exotic cultures. The country is celebrating Tourism Year 2011. Nepal started issuing coins in the 13th century during the reign of the Malla Kingdom. In the modern era, Shah Dynasty Silver Coinage from the 18th century onwards dominated the scene. The Shah Dynasty era also saw the issue of gold coins. Decimal Copper Coinage (100 Paisa = 1 Rupee) was introduced in 1921. Prior to this, issues were denominated in Dams, Dyaks, Tolas, and Mohars. The latter two were for gold coins that did not carry any denominations but was traded for silver at the bullion exchange rate. Commemorative gold coins were introduced in 1974 and they fetch a good premium over bullion value. The first issue was in the Conservation theme with a Crowned Bust in Obverse and a Great Indian Rhinoceros in Reverse. Nepalese commemorative gold coins (few thousands) and proofs (few hundreds) have low mintage thus accounting for the premium valuation. Coins $2 and up Common UNCs start around $2. WWII Gurkha Bullet Coins in VF, Paisas from the 18th century in VF, Recent High Value Silver Coins in XF, etc start around $10. Recent Commemorative Silver Proofs start around $40. Low Mintage High Value Silver Proofs, Recent Silver Proof Sets, Early Silver Coins in UNC, etc start around $100. Gold Coins, Rare Token Sets, etc go well into the 100s depending on condition and rarity. Paper Money $2 and up Common UNCs from the 1970s onward starts around $2. Recent UNC Bundles starts around $25. High Value UNCs, Early UNC Bundles etc start around $50. Rare Replacements, Specimens, High Value Bundles, etc go well into the 100s. Garments, gems, jewelry, khukuri, tea, and paintings are some of the souvenirs visitors take back with them. Ethnic, Regional and Tribal Jewelry $3 and up Silver Turquoise Bracelets start around $3. Rock Crystal Bead Ethnic Necklaces start around $20. Silver Turquoise Coral Necklaces start around $50. Antiques $10 and up 19th century maps, vintage copper spoons, etc start around $10. Dancing Ganesh and Nataraj statues start around $50. Monpa Tribal Masks, Snuff Bottles, Guardian Figures etc go into the 100s. Exquisite Copper painted inlay turquoise Garuda and other statues go into the 1000s. Art $10 and up 19th century local scenes prints and historical photos start around $10. Gold Tangka Tanka paintings start around $30 and go into the 100s.Vintage Bronze Buddha statues, Copper Inlay Turquoise Dragon Conch Trumpets, Kalachakra Mandala’s etc go into the 100s and 1000s. Crafts $3 and up Handmade Paper Lokta greeting cards start around $3. Wooden lion candle stands, Prayer Wheels, and statues start around $30. Hand carved peacock windows go into the 100s.